Please post on this rather than just repping, this thread keeps on getting 100+ views without a single post and falling off the front page as a result. There's nothing wrong with just posting "Support". Look out for red writing to see what I need suggestions for. Abridged version: Go exploring a bit and you might find bosses of extremely variable difficulty, and very little predictability. But first, here's the thing to put in your signature, if you wish to support the idea. And here's the uncropped image because it looks cool. When you hear a deep roar close behind you as you explore the caverns, you instantly regret not going back when you ran out of torches, because the shadows have spawned the horror of the latest update: A forgotten beast. There is hope, but much uncertainty. It might be a small blob of ash that does nothing special. Or it might be a giant spider made of diamond, with an obscene amount of health and the ability to cut through you like a hot knife through butter while removing your little ability to see in the dark. OH GOD FIRE FIRE EVERYWHERE IT'S MADE OF FIRE AND IT SHOOTS FIRE IT'S JUST A BLOB OF FIRE. That's the !!fun!! bit about forgotten beasts. They might just be a nice big fire bomb. You could capture a FB and build a trap that feeds the unwary to it, because lava is boring. You could go out into an extreme hills biome, seeking to hunt flying forgotten beasts Skyrim style. You could find the location of a uniquely powerful and giant kraken-like beast, and declare yourself an admiral as you lead your unsuspecting friends in a fleet of boats, who wondering why you asked them to carry bows, into the Minecraft battle of their lives. You never know what to expect, the weakest Forgotten Beasts might be about as dangerous as a leather armoured Zombie with a wooden sword, while the strongest are comparable in power to the Enderdragon leading an army of Withers. But generally they'll have far less health and damage than this. A fun part of Dwarf Fortress, the original mining and crafting game that partially inspired Minecraft, is the completely unique monsters that would sometimes come out of the caverns. The best bit is, this isn't just text. Everything mentioned there except for the squirming and fidgeting is taken into account by the game engine when it came to simulating the boss, even the tiny difference a lack of skin makes. And the variety of monsters is huge. You could get anything from a harmless blob of snow to a flying insect made of adamantine breathing out a poison that was randomly generated along with the beast, and so happened to be instantly fatal. You also get everything inbetween. Web shooting golem made of incredibly sharp emeralds? Check. Vampiric quadruped made of fire? Check. Flying fleshy blob breathing poison dust? Check. Dwarf Fortress doesn't have proper graphics, so there was no need to render them. But Minecraft would need to render them. Fortunately, this is possible, since none of the attributes need to be merged. Merging attributes, e.g a cross between feathers and scales, requires some imagination, which computers lack. So let's use the example mentioned for our automated construction of a forgotten beast. Since this is an attribute, and not a combination, Minecraft would have a model of a Dimetrodon stored somewhere. Only the model is used, and the texture placement of the eyes, claws and teeth which is overlaid all the other textures later. Secondly, it has fan-like antennae. 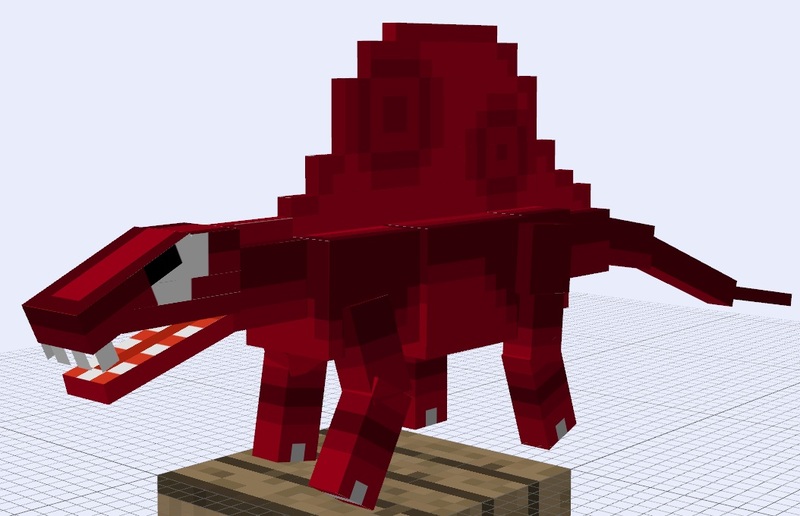 Minecraft has this model stored somewhere for this purpose, and it places them on a location of the dimetrodon model. The location is defined by metadata to be on the head. Thirdly, the texture. A tessalating fleshy texture is simply applied over the whole creature, and then the dimetrodon details texture is applied, giving it teeth, claws, and a mouth. Now our dimetrodon is a lot like the above picture, except with visible muscle and antennae. So, it has spittle as a ranged attack. This will debuff what it hits. Walking forgotten beasts will randomly swap between a zombie and a skeleton AI (Latter only if there's a ranged attack). Flying forgotten beasts will probably use ghast AI and some meleeified ghast AI. To prevent them from being easily beaten with a bow or by attacking through a 1x1 hole, they'd have the added buffs of a high on average speed, and a long range melee attack in addition to normal melee. This long range melee is less effective than close range melee unless the player is in close range. This attack has a random reaction time, so it might end up triggering too early and striking while the player is out of range, or going too late with the same result. Also, it takes time to aim the angle of it. But still, you're probably going to get hit quite a lot if you try hitting it through a 1x1 hole, and even when you can take advantage of the limited aiming speed, it's still going to take some skill. Meaning Forgotten Beasts that have been around for a while and are non-aquatic will likely end up in caves or forests, perhaps even buildings for the powerful beasts that scare players away. A non-blob forgotten beast will eventually specify a point as being its lair, which it will stay close to when it's not going after players. It will only detatch from that lair if severly wounded near it. Any singular items near the lair will be placed along the walls in item frames. So you'll know you've found a lair when there's a full set of armour and tools in item frames everywhere. Lastly, some things that depend on the creature shape. Blob and serpent are single creature shapes, 4 and 6+ limbed refer to multiple creature shapes. Important note: They don't look like slimes. Explained in 'Solutions'. Gets bigger, therefore tougher, when it kills anything in melee. Caps at sizevalue 999, 50 blocks high. Health increases when max health increases like this. Health will not decrease along with max health when downgrading. Dies at half its original size. Far greater body distortion abilities, so it can fit through pretty much any gap. Ignores block collisions from any side of its body unless 80% of that side is colliding. So the small ones can squeeze into your building, the big ones go through it. Defences are uniquely rubbish against this type of forgotten beast, this just rolls over towns very rapidly killing anything inside. A village is a quick way for one of theses to get really large. Charging, which is pretty straightforward: Literally. Low turning speed while charging, very high speed and damage, weapon knockback will only slow it down. So get out the way. The long range melee on these is rapid enough to pretty much be the main attack, rather than just anti-coward. And nothing else. Difficult in a simple way. Climbing is just spider climbing upgraded to mostly ignore 1 block differences in the wall. Jumping is aimed to land on whatever target position or enemy the creature is aiming for. Alright, we've got a forgotten beast! Now, the simulation of a forgotten beast creation I did mostly assumed Dwarf Fortress attributes, Minecraft would have its own body shapes and materials. But body shapes would still be grouped into blob, serpent/fish, 4 limbed and 6+ limbed, and there would still be stuff like fire, iron, and snow. Spawn frequency almost none on the first day and maxes on day specified on world creation, defaulting at 100, able to be toggled between 10, 20, 50, 100, 200, 500, 1000. These things will run out soon enough if you stay anywhere for long enough. Only one can ever spawn per 2x2 chunk area. When one spawns it will mark a 2x2 chunk area as used. Rather than despawning if they meet their despawning conditions, they will respawn, with full health, in the place they despawned once that area is loaded. The maximum distance a forgotten beast can be from the player and still simulate is far longer, as well as the maximum and minimum distances for one spawning. They cannot spawn within 32 blocks of artificial lighting. And they can have spawn eggs like normal monsters, which will create a random FB. Every 10 seconds, the game will "roll" to decide if a Forgotten Beast will spawn, once per player. Then, it will calculate the size of the beast that will be spawned. Then it finds a suitable place to spawn that is large enough for the beast, assuming it is a cube with the same amount of ability to compress as a non-blob. "Large enough" takes compression into account. Then it checks that it is not within a chunk marked as "Used". Cancels if it is. Then it does a count of nearby blocks(15x15x15 cube around spawn). The (percentage that are not air-30) is the percent chance of the spawn of a beast being confirmed, and procession with the rest of the FB creation. This means that spawn rate maxes at one FB every 75 minutes on superflat, gradually decreases chunks get marked. I really don't want to go to the trouble of calculating for jungles and caves, but they'd have far higher spawn rates due to the percentage-air count, exactly as intended. An amount of experience and FB material proportional to the size of the beast. See bottom of attributes for quantity. You can gain reputation with a village for killing a forgotten beast within 200 blocks of it. "Urist Mcbeastkiller has killed an giant fire breathing Forgotten Beast of obsidian in the shape of an octopus!" It displays all the stats of the beast it came from on mouseover. At the cost of 10 levels, 2 beast extracts can be crafted with an egg to make an beast egg. Extracts are not used up. For each stat of the egg, a random one of the ingredient extracts will have the corresponding stat used. A lot like alleles in real life breeding. Also, each number in the stats would have a 1/50 chance of being rerandomized. Beast eggs will not display their stats, and have a random skin. Beast eggs are placeable and have the model of the Dragon Egg. Beast eggs take 14 days to hatch. Beast size starts out as 1/3, and grows gradually to full size. What about using a Dragon Egg instead of a regular egg? Combine 7 beast extracts, a nether star, and a dragon egg, result? Well, nether stars come from the Wither, which has multiple heads. Dragon Eggs implies dragons and fire. 7 beast extracts implies 7 beasts. So the logical result of the combination? Ender themed dragon hydra with each head shooting something different. We'll call her Världen Ände for now. 40 blocks long between shoulders and tail base while flying and 30 tall at the shoulder walking. 7000 health, which regenerates at 1 a second, even while far away from players. 20 block long 7 heads and 3 tails lash out at players, doing 10 damage on hit. But dodgable. Teleports if it is colliding with more than 20 blocks at a time while flying, or if it is stuck while walking. Always simulates approximate position, and makes sure to stay within 100,000 blocks of a player. So unlike FBs, which require a player to come within a certain range to simulate like any mob, Världen Ände can come into simulation range without a player budging an inch. The egg, when placed, looks just like a Dragon Egg, but 3x3x3 in size. It is as hard as bedrock. It will hatch when it has been placed for more than 7 days, and the full moon is directly overhead. When it hatches, a black hole occurs, growing to 30 blocks in radius, and deleting all non-bedrock it touches. Then the black hole implodes and releases the full sized beast in a flying state. This is all a cutscene, since no sane player would want to be anywhere near the thing. Because it has one head shooting dense conical fire. This is like the attribute, but 10° spread and 30 block range. One head shotgunning fire charges. 21 every 7 seconds with a 30° spread. One head intermittently spraying fire charges. 7 every 3 seconds, over 1 second, with a 20° spread. One head shotgunning ghast fireballs. 7 every 7 seconds, with a 15° spread. 7 every 9 seconds, over 1 second, with a 10° spread. One head frequently shooting inaccurate lasers. Does the damage of lava, destroys 1 non-bedrock block a second. Very slow to aim, but fires whenever it can. Once every 6 seconds, lasts 3 seconds. One head rarely firing powerful lasers. Lacks the aim debuff of the other laser. Removes several non-bedrock blocks per shot. Fires, 3x3 beam lasts 0.5 seconds. Only damages target once per shot, but does 20 hearts of damage. This thing isn't really meant to be killed, it would take the population of a large server to come out in full force (Or just Cacame Awemedinade) to threaten this beastie. It's really just meant to terrorise the whole Minecraft world slightly, since this thing shoots everything it has at players/animals it can see or where it saw a player less than 30 seconds ago. But this thing would only appear very rarely due to the 100k block wander range, and only stick around for more than a few laps of firespam if you do more than 20 hearts of damage to it. And even then it can still lose interest. You'd be best off hiding when you see it appear from behind the mountains though. Due to the fact that this gives Dragon Eggs a use, Dragon Eggs should be safely renewable but there should not be one available while Världen Ände already exists. How should this work? Most/all would have deep roaring sounds. Maybe not blob. Roaring sound would be slightly metallicy for nonorganics. Forgotten Beasts target all passive mobs, except for bats. Forgotten Beasts despawn when difficulty is changed to peaceful, and respawn when changed back. Poison types and powers are influenced by special attack type. Special attacks that do no damage are guaranteed to have a poison, at a high median level. No/Passive special (Melee poisons) has a medium chance of having a poison, at a middle median level. Damaging special attacks have a low chance of having a poison, at a low median level. Remember this is just weighting for random rolls, damaging special attacks can have every type of poison maxed. So cursed fire pretty much. Plenty of !!Fun!! The size variation is enormous. The median is sizevalue 99 (5 blocks high). Most Forgotten Beasts are land based, flying beasts are a challenging minority, although they may be as common as land based beasts in extreme hills. There are no aquatic Forgotten Beasts outside the ocean, though there may be amphibian types. They'd just be named "Forgotten Beast", no individual naming. 1/1000 chance a forgotten beast is instead named "Forgotten Beat" and is perfectly normal other than the fact that it plays two songs at any one time, and drops every disc on death. There's a lot of things that look like they'd require some really weird coding to work. So I'll go through them. For limbed creatures, any body part touching a block is folded away from that block, like you have your arm stuck out, and then you retract it by bending at both the shoulder and elbow. The actual part of the creature that collides with blocks no matter what is probably something a bit smaller than the main body. Blobs are cubes that can distort into rectangular prisms, with rectangular prisms attached to their sides except for their bottom. These compress away from blocks rather than fold away, assuming they're actually in a situation where they will collide. The centre body also compresses. The amount the size of a blob can change is pretty huge, blobs at least 10 blocks tall should be able to squeeze themselves into a 2x2 hallway. They'd be stored like players. But rather than having stats, posistion, and inventory memorised for each player name, FBs have only posistion, and size if they're a blob. Their health = max health when loaded. 201 is a likely ID since this is not a standard mob. 01 is body shape #2, serpent. 049 is a block/item ID. If this referred to feather, it would give the beast a feather over flesh material; if rotten flesh, skinless flesh; if leather, fur. But 049 is obsidian, so this is an obsidian beast. 667 means the colour of that obsidian will be multiplied by 7/8 for red, 7/8 for green, and 8/8 for blue. 105 #1 is the size of this creature. Exists for blobs and babies. 105 #2 is the basesize, for calculating when a blob should die, and what size a creature should grow to be. 000020 is what details the beast should have. The fifth number is wings, the 2 means the second type of wings, spined. 2 is the type of special attack, in this case splash poison blobs. 0 is none. 35000000 is the poison types and strength. 3 is level 3 poison, 5 is level 5 wither, the 0s are all other things. This is special attack effect or melee effect, depending on special. Hey! It's the code for the snake in the top picture! Everything is immune to drowning, but Magma, Fire and Smoke take damage from and cannot spawn in water. Stone, Obsidian, Iron, Gold, Bedrock and Emerald are immune to magma and fire. Sand, Sandstone and Glass are immune to fire. 1 Fire (Fire charge) 1/2 opacity, level 2 speed buff, leaves a trail of fire like snowmen leave snow. 0.5 Lava (Lava) Leaves a trail of fire like snowmen leave snow. Places lava sources instead of dropping items. 2 Smoke (Air) 1/10th opacity, level 10 speed buff. 0 Bedrock (Bedrock) Exists for abstract uses through commands. Laser beam, 0.5 second charging animation during which aiming is disabled, replaces one non bedrock block it hits with a fire block, 1x1 wide beam, 10 hearts damage, 8 second interval. Size value ranges between 0-999. Size is (Sizevalue+1)÷20, in blocks. So size 999 is 50 blocks high, 99 is 5, 0 is 1/20th. Damage multiplier is the cube root of (9500x(Sizevalue+1)+50000), in percent. Which puts 5 block highs at 100% damage, player sized at 75%, 10 block highs at 125%, 25 block highs at 169%, and godzilla (50 blocks high) at 212%. Health multiplier is 0.9x(Sizevalue+1)+10, in percent. Which puts 5 block highs at 100% damage, player sized at 46%, 10 block highs at 190%, 25 block highs at 460%, and 50 blocks high (A challenge for the whole server!) at 910%. The total number of items dropped is 0.05x(Sizevalue+1)+1, rounded up. So 6 for 5 block highs, and 51 for godzilla. The amount of experience is the same x20. Wow. Excellent idea! I've actually considered suggesting randomly generated monsters, but you went into detail. Full support! It shouldnt be spawnable in the nether. I agree with the jungle part. Jungle doesn't seem much like a haven biome to me. sure, why not? this would be cool. "Why not" is not a reason, because it only implies it will not make the game worse, but it will still require effort to add this to the game. Just because I've made this suggestion very realistic to make doesn't mean it'll be easy. At least as much effort as a large update is required. Whew... would require quite a bit of coding prowess, but... man, if we could have this in MC... well, what I'm trying to say is that this is a good, and decently put together idea. I mean, if at all possible... just think of the possibilities! lol. Though... it would require quite a few extra textures (for the various skin types) several extra models (for the varying... er... varieties), and some way to put it all together. I'd kinda like to see this in the game, and it would finally make me think twice before going into a mine, unprepared... er.. that is, again. Just to scale it down the OP ladder... perhaps the stronger varieties could be rarer, as well... oh, and, just a detail I think you missed (sorry if you didn't, I skimmed through to re-read it, and am tired, right now) is... what would these things drop? Would a 'fleshy' monster drop rotten flesh? porkchops? something else entirely? I missed doing what they would drop. I'll do that. But I already did indirectly state that rarity increases with difficulty. Difficulty is proportional to size, rarity is proportional to size difference from median. This would take a fair bit of coding, but the results would be fantastic. I think randomly generated things is the way minecraft needs to go. This idea would add so much more adventure, surprise and variety to the game. I can just imagine going out to battle a boss that I have no idea what will be. Maybe if they dropped a trophy on their death? Just a small little thing you can place that would show the boss and its powers. It wouldn't do anything, just like the ender egg, only act as a trophy so you can start a collection. Nice job on the idea! I haven't got any ideas for unique items resulting from the killing of Forgotten Beasts. It certainly is possible, Forgotten Beasts would require a similar memory system to that of players, but rather than names they have a string of numbers representing their attributes (A normal ID would also be necessary to prevent glitches when people spawn multiple FBs with the same attribute) The trophy would use this number in the same way that player heads use player names. Again, nice idea, though... perhaps a little more detail on the dropped items? You've just defeated the giant, feathered, fire-breathing, flying spider! :/. Perhaps additional drops could have something to do with whatever power they use? such as... fire charges if you defeat a fire-breather, a potion of poison(unextended, unstrengthened) if you defeat an acid-spitter, ect, ect.. just a thought, is all. Overall, I like the concept. Being able to create pseudo-random procedural generated monsters sounds neat. I'm not sure how difficult it would be to code, but if it could be done, then great. In fact, maybe the game could overhaul the entire mob generation system to allow for greater variability of mobs. For example, zombies spawn with missing arms or exposes rib cages (which changes the model) and different skins. I think it's a most likely a very big job, but one that could have tremendous impact. Support. I'm still working on drops. Feathers are a submaterial of flesh, so there'll be meat as well. But not fantastic in the sense of impossible fantasy. Be careful adding drops. I'm not a fan of adding drops just to add stuff - it needs to have a purpose. I'm perfectly ok adding aesthetic updates or new creatures that provide ambiance to the game, but I wouldn't want to see 20 different types of meat, scale, skin, feather, claw, and tooth drops. ideally, the monsters should use pre-existing drops as much as possible. My intention exactly, and what I preach on other threads. Meat will all be steak and rotten flesh, since they're the most generic types. Feather certainly wouldn't need a new type. Claws and teeth aren't dropped at all. I will explain the new drop this would add eventually, but my first priority is to propose the other end of the deal on the Dwarf Fortress forums: What Mojang does for Dwarf Fortress in exchange.